I was thinking about the grocery store industry this morning and how much of what we buy is dependent on brand name recognition. The grocery industry has been in the news a lot lately. Amazon's entrance into this sector has a lot of very big companies shaking in their boots. They've never had to compete with someone who doesn't care if they make a profit. I notice that my favorite brand of Bush Family Beans is getting harder to find. They are migrating it closer and closer to the floor. Their hope is that I will get tired of looking for it and reach for a house-brand instead. I first tried out that bean because I thought it was cool how the family dog would come out during the commercial and talk with us. I know that it won't be long until I can only buy the beans with the soviet style labels. I don't think this is necessarily such a bad thing. Narrowing the focus to fewer vendors will require Kroger to compete on quality instead of graphics. This lead me to thinking about branding in general. Take a walk down the cereal aisle and look at the metrics they compete with. You have a buccaneer pirate doing battle with a cornflakes rooster and right next to both of them is Tony the Tiger and some kind of bird of paradise sitting on colored cocoa puffs. The entire focus is on branding. There is a reason when you open the 14 inch tall box it only has 9 inches worth of contents. This is about to change.The 400 lb gorilla summoned a lot all of the food manufacturers to a meeting last May to discuss packaging. KingKong told them they should stop focusing on graphics and instead design a package that can be delivered to your house in two hours. This kind of packaging means more product can fit on a truck and more parcels can fit on a pallet in a much smaller warehouse that is more centrally located. I wonder how this will eventually affect custom cabinet shops. My company has never done anything but residential work but I have hired many people over the years that came from the store fixture industry. The shakeout in brick & mortar has to be just killing this sector. If not now then soon. Brand promotion is being replaced by crowd-sourced reviews. More and more today you look at the number of stars and the quantity of reviews before spending any more time on research. We didn't used to have Yelp. You have to pay a lot more attention now to customer morale than you used to, particularly with the customers you don't work for. The grocery store business is brutally competitive, they used to average a 2% profit. Any grocery stores left today will fare just fine. Amazon doesn't have any special moat because of what they do. IOW I just don't see people ordering groceries on the internet in any quantity. The facts are that retail continues to grow at the mall and elsewhere. But a brick and mortar is not as attractive an investment as an online store with practically no investment. So the big growth is in online stores. If you find a winner (not easy, from what I understand, even then how do you build a following when things are so easy to change with competition) the profits can be huge with hardly any investment. The reviews on Amazon are dubious because of shills, although Amazon has started putting "purchase verified" tags on the reviews which helps. Anyway your dour perspective doesn't match reality. The cabinet business seems to be doing fine. Although at some point surely there will more and more factory built houses which will surely bite into the cabinet business. K&B and Toll Brothers have already invested heavily in manufactured homes. New home requirements will probably be mitigated by Boomers dying, but there is still going to be a large increase in home purchases. Demographics are very prescient on this. The bean zone in this (Kroger) grocery store used to have a really wide range of beans. Right now the bulk of the shelving is generic store brand. In fact much of the store contents are migrating to store brand. In this respect I would guess they are buying product placement from themselves. For 50 years the shelves were dominated by brand name merchandise and today it is primarily becoming store brand generic. Pat: You wrote "The facts are that retail continues to grow at the mall and elsewhere." I would disagree with you here. The big push now is to repurpose mall real estate away from retail and into other uses , in some cases warehousing for online businesses. I am not sure how much of the cabinet industry is dependent on store fixtures. I would, however, still suspect that this niche is joined by the hip to brick & mortar success. You are entitled to your opinion but you are not entitled to your own facts. The changes in mall traffic is most likely about demographics, anecdotally the malls in younger family areas seem very busy, the ones in older communities seem slow. And of course online sales impact this as well. I believe some of the activity on the shelves may be what Alan has talked about in the past, the benefits of the short menu. What point are you trying to make with this chart? The point that I AM making is that that brick and mortar sales are still growing. That chart appears to stop around the year 2013. Have you noticed any changes since then? "I just don't see people ordering groceries on the internet in any quantity." Then you must not know many millennials. I don't know where it's going, and I wouldn't put _much_ money on it, but I'm _pretty_ sure that in the next 10 years a huge amount of non-perishable food items will be delivered by UPS or the equivalent (including the touted Amazon delivery vehicle). then brick and mortar is 310K. 9% shown in the third graph. What percentage of total food sales is non-perishable food? Nothing that contains fiber, which is a growing concern. You Can write the St Louis fed to find the reasons why. "What percentage of total food sales is non-perishable food? Nothing that contains fiber, which is a growing concern." All kinds of whole grain have very high fiber. This includes cereals, crackers and pasta made with them. Also the thread starter Baked Beans. Canned green beans, peas, carrots and tomatoes that are all high fiber. Maybe you didn't mean "fiber"? On a slightly different trajectory, there is a reason that brings me to the bean aisle. Each time I go to the grocery store I try to buy at least three items I might want to have around if we have an earthquake or a hurricane or Mueller indicts the Trump family. My understanding is that anything that has fiber in it is perishable, the more fiber the more perishable. 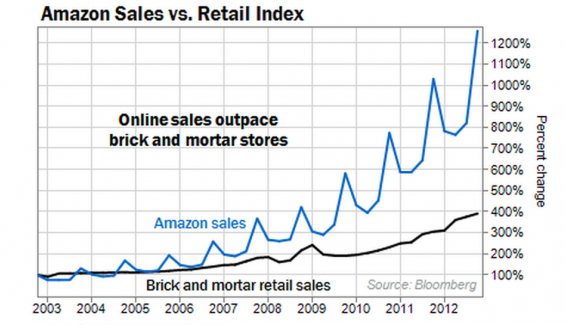 >88% of retail sales are still to brick and mortar stores. "albeit mostly groceries and gas"
The point is that they are saying 9% of sales are going to online sales. It is growing but still a small percentage of total sales. Bottom line most sales go to groceries and fuel. There is no way that is going to be taken over by online sales. >The point is that they are saying 9% of sales are going to online sales. It is growing but still a small percentage of total sales. that 26% of sales are going to online sales. >Bottom line most sales go to groceries and fuel. There is no way that is going to be taken over by online sales. but at a far slower rate then online increases. The concept is the grocery store sells space to manufacturers for placement, look at the end caps and display tables. The placement is not a random event, its based on income which can be a loss before the reimbursement for space. Grocery stores are evolving software wise to start presenting you with choice you make and similar items just like amazon does when you come in the store. Some of it involves facial recognition, some your mobile device. They aren't just going to rollover to the online giant. They are working on the same concepts of merchandising and presentation. They may tell you where your beans are in a little bit. I noticed that my favorite brand of beer was $11 a six-pack last night. They are obviously testing the waters pricewise. This beer generally hovers between $8 & $10 depending on what day of the week you are shopping. The triscuits come in a variety of flavors. The one that is always sold out is the "original" flavor. Despite it's popularity they put it on the very bottom shelf so low you sometimes have to grovel to get it. They are doing this to engender interest in the esoteric flavors on more convenient shelves. In general, however, I will not trade personal information for a discount in price. The first thing I do when I get into the grocery store is go for the cash machine. I pay for my groceries with twenty dollar bills because I don't think it is necessary to help the actuaries in pricing my personal insurance premiums. Just wear your Tim foil hat & they won't be any wiser. You also mention end-caps and display tables. This is kind of a different topic but a great segue into something called "Blue Ocean Strategies". For many years in America the wine industry was dominated by four major players who controlled 90% of the trade and fifteen hundred vineyards that carved each other up for the remaining 10%. They did their marketing on the basis of metrics that only made sense to them. They did their best to sell the public on the concept that wine is complicated and you need to be trained to appreciate it. They called themselves names like " Blah Blah Blah Chateau" or "Blah Blah Blah Estates". All you had to do was look at the label to know you were in good hands. The parallel in our industry might be solid lumber dovetail drawer boxes. This is a feature that is only important to cabinetmakers and architects and that's only because they don't have very many ideas. Despite all the combined marketing by the wine cabal the total number of bottles sold each year never really changed. Until YellowTail wine came along. YellowTail did not try to compete for the existing customers. They instead went after college girls who nobody was competing for. These kids didn't want to have to learn anything complicated, they just wanted to cop a buzz. They differentiated themselves in one big important way. They used lean thinking to standardize the shape of their bottles. A typical white wine bottle has a tapered neck whereas a Bordeaux has more of a square shoulder. By standardizing the wine bottle shapes they could create packaging that presented both white & red wine in the same footprint. Footprint was key to selling in convenience stores like 7-11. Kids are willing to roam the store on their way to the beer cooler but totally unwilling to get out of line for an impulse purchase. Standardized dimensions meant that you could easily reach over to add a bottle on your way out of the store. Since the wine labels didn't offer much additional information there was nothing to study before making the purchase. The Blue Sky opportunity in our industry is transparent pricing. We leave a lot of sales on the table because we have not yet figured out a way to elegantly talk about what things cost. "The Blue Sky opportunity in our industry is transparent pricing. We leave a lot of sales on the table because we have not yet figured out a way to elegantly talk about what things cost." Some years ago I published (web) general pricing guides for furniture refinishing and re-upholstery. "How much does it cost to ..." was the substance of 80% of our inbound inquiries. Those guides now get 60% of our inbound web traffic. People are hungry for price signals - especially early in the decision cycle. This conversation is all very retail oriented. I'm curious what percentage of custom cabinet shops cater mostly to retail vs. wholesale? I basically refuse all retail work, so most of the assumptions and conclusions in this thread do not apply to me. In fact I purposefully make it as difficult as possible for owner-contractors to find me. I have to assume there are many others like me and therefore a whole segment of the custom cabinet business that caters primarily to custom home builders. These builders solicit bids, the shops are either awarded the job or not based on those bids, and we are never present when the bids are discussed with the homeowners. Although price is a consideration, most likely the builder will sway the homeowner into selecting the cabinetmaker that best suits the needs of the builder. So our customer is in fact the builder, and in my experience builders are not impressed with slick marketing. It might get you a bid opportunity, which may in turn lead to a job, but if you fall flat on your face all the marketing in the world will not give you another opportunity with that builder. I guess in this analogy we are the Bush's Baked Beans that you can't find as easily as the Kroger Beans. I don't think this thread is so much about slick marketing as it is about how to make yourself relevant for any customer group you wish to sell to. In the case of YellowTail wine they made themselves relevant by creating a kiosk that could hold both red & white wine within arms reach of someone standing in line to buy smokes. In your case it is not exactly as simple as parsing whether or not it is a retail transaction or a wholesale transaction. The scenario probably gets muddier depending on the scale of contractor you are selling to and the size of project you are building. What works for the behemoth contractor with Lieutenants & Sergeants & Corporals between you and the client would not work for a wholesale transaction with a GC from Romania who hires relatives that work on the weekend. Your product depends on a certain amount of cushion in the schedule commensurate with the layers of bureaucracy involved. What is important to the minions you report to is that you keep their boss off their back. You need to provide a way of staying up on changes at the jobsite that impact measurements you took a month ago. If the HVAC guy ends up having to put his work in a different location than the greenhorn architect called out you have to hope that the memo makes it all the way to your desk in time to shrink the drawer banks. Projects that are big enough to have a significant amount of protocol are typically produced by famous architects who hire indentured youngsters to draw the cabinets. The aspiring architect hasn't been in business long enough to understand that his long term success will depend on having good relationships with guys like you. And since this is his or her first time to ride the pony they are not going to be terribly receptive to your input. You can bill the contractor for these changes but now you have a harried site manager giving you the cold shoulder because his boss yelled at him over the $300 invoice you sent in for fixing the drawers. One way you could differentiate your service is to come up with a list of things that need to be verified on each and every job. The site manager is a busy busy dude. He will tell you anything if it means you will leave him alone and he can have a sandwich. Little things like speaker wires or low voltage security are easily forgotten but will need an accommodation in your cabinets. Is real simple to not account for the thickness of plywood shear wall in a small space or remember to update you when the designer comes through waving his arms then changing the window casing to add a back band molding. Fabrication is your simplest problem What your jobs suffer from are lack of timely decisions. There is also the battle of titans between the designer and architect. The architect has been on the project since conception a year ago. The designer comes on board after the plaster is in place and says "Have you ever considered....?" Her job is to wrest control from the architect and she is not at all adverse about cozying up to the homeowner and cutting him off at the knees. If a new sheriff comes to town is always best to realign your loyalties because the designer is always going to win. Then, of course, there is the velocity in the economy to factor in. Under the scenarios I described your only fort is high prices. You can get these high prices until the economy starts to slow down. On that day you need to have cost under control. Try telling a contractor sometime that he needs to help you contain cost. We always bad mouth and fight the Chinese because they supposedly sell their wares below the price to produce them. Why doesn't the government do the same thing with Amazon and subject them to "anit-dumping" duties? They're doing the same thing WalMart did. Another race to the bottom all over again. This time we're preying upon the fact that Americans are now too lazy to even go to the store. Mostly because cronies wouldn't allow it, the Chinese lobby group is the biggest on K street, and comparative advantage benefits everybody. The unemployment rate is very low, who is going to build these toasters? BTW the Chinese labor is now expensive to where they also will now be providing services. My comments are primarily based on the original assumption on how products are marketed in retail. Single store / retail is very much like dealing direct with a homeowner that is often running out of money as the cabinet work gets closer. Performing multiple store retail is a solve the problem once and then make all the stores the same or with increase decrease in quantities. A store with multiple outlets wont make 5 elevations of displays "fit" the field dimensions, they make the construction work so every fixture can be merchandised the same. If they want to add shelves next season or change the shelf material the last thing they want to do is measure every fixture and store. There is lots of repetition which is good for production and is simpler to manage. The engineering costs can be very low if stores repeat year in and year out. Where home cabinets reflect the owners personality and likes, retail cabinets are designed to present a brand, look and feel and present the merchandise in the best manner. We started getting some groceries from a farm to table dealer that delivered once every 2 weeks (to us - one could get once a month up to once a week, depending upon volume) - Green Bean. This was premium baked goods, boutique canned goods, fresh seasonal vegetables and fruits that were for the most part far better that Kroger. Some things, many things are phenomenal. All ordering is done online. Prices are higher for equivalent items. Then the Kroger came up with Clicklist - an internet based picking service that had every item in the store online. I have not been in a grocery store for two years as a result. My wife makes the list online, and sets a pick up time, and I go get it all. Now, the quality is different and the offerings are different. Produce is an ongoing problem - they just don't pick it like my wife or I would. Fine for the basics and bulk of our needs. But the BigStore down the road is talking about picking and delivery, and we are listening. As a result, nothing has changed in my shop. Your anecdotal story is unconvincing. Most retail will remain in brick and motar. I agree that retail is not going away. However it will become much more specialized. For example in my area there are small independent boutique grocers that offer only fresh local meat, produce and milk cheeses etc. They don't compete in the packaged goods arena, something that can be easily shipped. The biggest hurdle for most online sales is the final mile. WSJ reported yesterday that Amazon has been working with real estate companies about putting in code-accessible storage lockers. The tenants of high occupancy buildings would be able to pick up their own packages with no labor on the part of client.